When Just Cause 3 was released in 2015, I had thought it was the conclusion to a trilogy. So it was a pleasant surprise to see Just Cause 4 unveiled earlier this year. For a start, logging into publisher Square Enix's account in the game's menu is now easier. 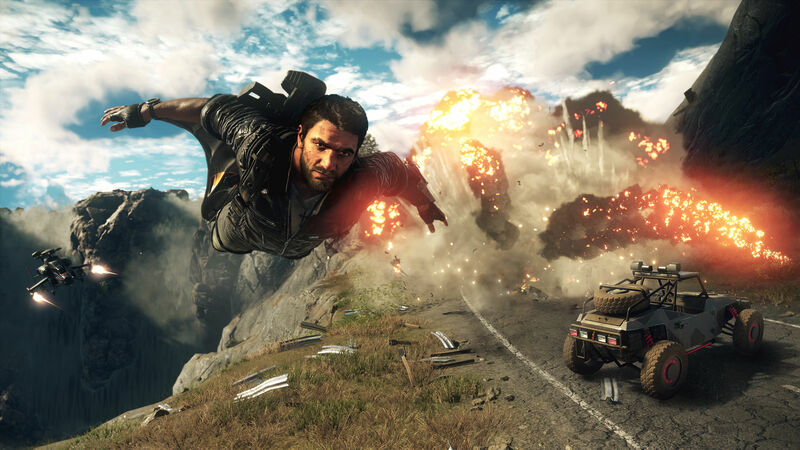 Continuing from the story in Just Cause 3, you play as familiar protagonist Rico Rodriguez, who now finds himself in a fictional South American location known as Solis. Solis comprises four biomes, each with much terrain and wildlife to discover. It also packs more weather effects such as sandstorms, tornadoes and lightnings that players will have to navigate around. In his quest to find answers relating to his father, Rico joins forces with other characters in the game to build a resistance force against Black Hand, a private army linked to the dictators from his past encounters. The usual arsenal of tools and weapons is available from the beginning. A grappling hook lets Rico pull himself ahead and towards either a person, vehicle or platform that is within range. Combine that with a parachute and he can lunge skywards and float over a large area. For traversing longer distances, he can switch to his wingsuit. Rico can pick and carry two types of weapons from a wide selection of choices, although the dual-wielding pistols and sticky C4 explosives from the last game are missing from this game. To progress, Rico allies with three key figures and helps them with their pursuits. With Nick, a local soldier, he takes on rescue missions to free civilians and recruit them as freedom fighters. With Garland, a stunt movie producer, he attempts to complete various stunts with specific requirements in order to score booster upgrades. With Javi, an archaeologist, he helps to uncover secrets within tombs to earn upgrades for tools. Completing these objectives unlocks resources to expand the frontline of Rico's influence, one territory at a time. There are over 1000 square kilometres of land waiting to be liberated. With High Dynamic Range (HDR) settings, the game projects beautiful and photorealistic backdrops even on a non-PS4 Pro console. Be sure to get the latest update patch online that addresses the known graphical and stability issues. Another key upgrade in Just Cause 4 is with the grappling hook. Apart from being able to tether two items together, players can now attach the grappling hook to air balloons and rocket boosters, with three degrees of intensity - low, medium and high. By combining different intensity settings, you get oodles of possibilities, such as creating a modified transport or causing major disruptions when facing hostile threats. Anytime you wish to take a break from all the madness, just hop into any vehicle and tune in to one of the in-game radio stations. Some of the chatter from the radio stations are quite hilarious. But despite the new features, I can't help feeling that Just Cause 4 has fallen a little short in terms of meeting its potential. This is because given all the insane enhancements you can conjure with, there is no opportunity to share them with a buddy or friends over a multiplayer setting. The only way is to capture on video and share it online for others to see. I hope the next release will see a multiplayer feature. Verdict: Just Cause 4 retains the franchise's identity and offers oodles of gameplay creativity with an enhanced grappling hook, fancy tools and a massive playground. Mohd Nizam is a freelance writer.